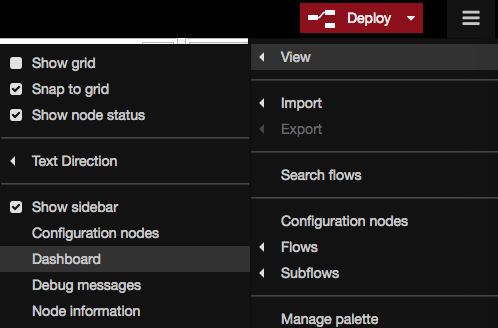 Node-RED Dashboard module allows you to very easily add a (very nice) graphic interface to a Node-RED project. The Dashboard module succeeds UI module . With this module you can add displays to view various forms of action: gauges, chart, text, notification, or the free HTML code. You can also add fields to interactions: button, switch, slider (slider), input field (text or digital), list of choice and forms. You can also uninstall since palette Manager. Note. To delete all Nodes of the UI module. Start by removing all the tables (Tab) before deleting Nodes, otherwise it is impossible to uninstall the module. 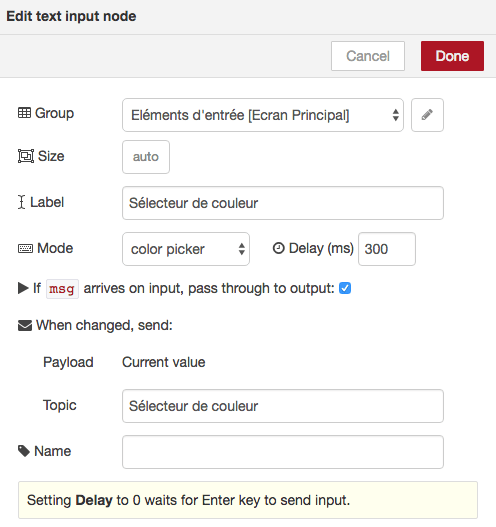 Open the Palette Manager and look for the module using the keyword dashboard . Then click install to install the module. At the end of the installation, refresh the display of the browser. In this tutorial we will explore the commands provided by this module. Before entering the heart of the matter, let’s see how to use icons. Several icons Open Source libraries can be used to customize the display of the components. Material Design ( https://material.io/icons/ ) is an Open Source project supported by Google. To use an icon, replace spaces by _, for example “account balance wallet”, enter “account_balance_wallet”. You can use the library of Open Source icons for projects AngularJS of Klarsys ( https://klarsys.github.io/angular-material-icons/ ). Use the icon name. 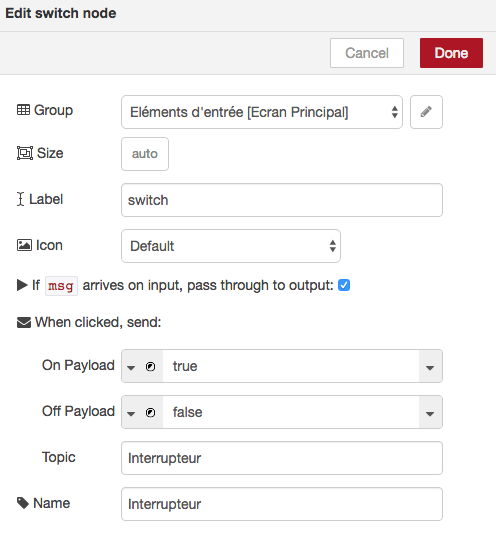 It is possible to create groups and pages directly from the control panel of each Node of the dashboard. When the module is discovered, it is much easier and clearer to go through the range of configuration which is added next to the console (debug). If the Panel is not visible (or if you closed it), go to the View menu then and finally dashboard . Choose a title. It will be displayed as the title of the page in the header of the Web browser. You can choose between two themes, dark with a black background (Dark) or clear with a white background, the graphic elements in blue (Light). click + tab to add a page. Open the editing window by pressing edit . Give a name and possibly one icon (see before how to do). Save with Done or Update . Here we give the main screen name and the home icon. Leaving the size of each widget is set automatically but in some cases you will need to change it by hand with the parameter Width. 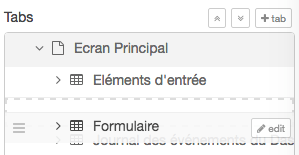 You can reorder the groups in a Tab, move them one tab to another and reorder the Tab and using the handle. The group is now ready. 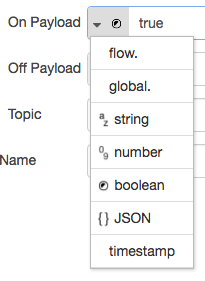 Now, let’s add one control items proposed by the module and find out what they allow and available parameters. 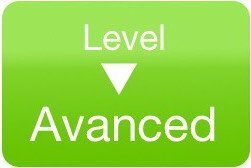 You will assign each element to the group ‘Elements of entry’, except the form that you will assign to the group “form. The Node can also be transparent and let an incoming message. For this, you must check the box “If msg can we input, pass trough to output”. the horizontal switch allows to return a Boolean when it changes state. It is possible to reverse the Boolean value by selecting by inverting the output value depending on the State On and Off. As well as the switch, the slider can pass an incoming transparent message (check if msg come…). 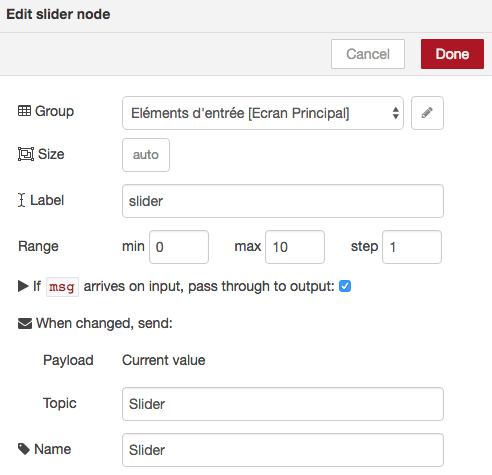 The slider takes as a parameter the minimum value (min), maximum (max) and not (step). Must be defined a range of entry (min, max). This field offers 4 input masks. 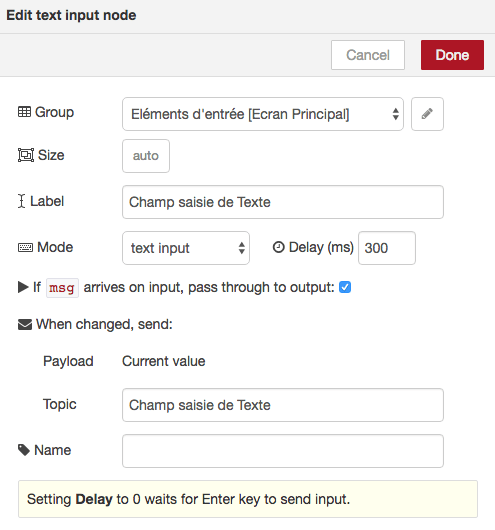 If a delay (delay) is specified (default 300ms), the Node reference value entered automatically. It is convenient for use on tablet. If period is zero (0), then confirm the entry by pressing the Enter key. In this case the characters are masked. It return the color in hexadecimal format code. It uses the color selector of the system. This field check that the email entered is correct. Last big piece of the Dashbord, the form . It is a component really very powerful and very simple to implement. 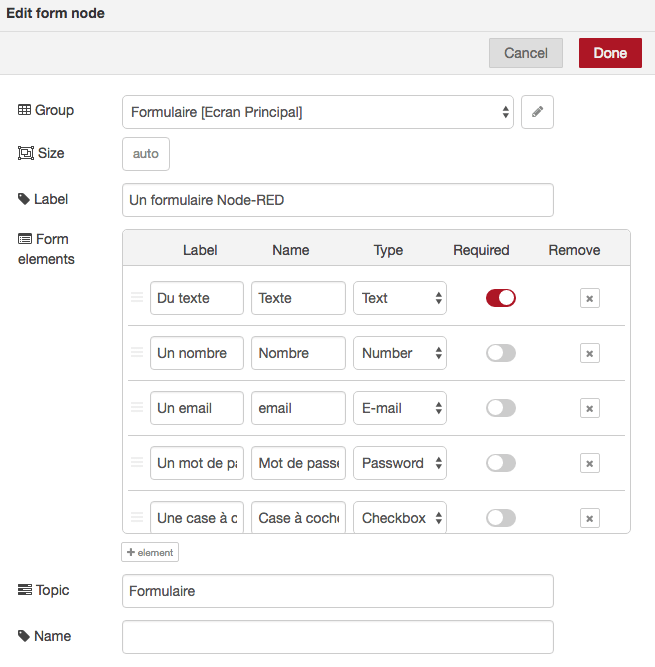 You can make each mandatory element (Required) before the release of the form. Here is the resulting form. Now let’s see what it looks like. I offer you a small piece of code that stores all events and posters in the form of an event log (log) in a global variable. 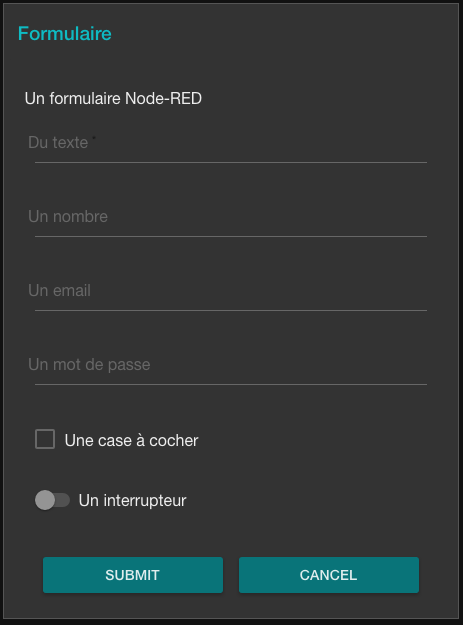 Add a function Node and paste this code. Events on the interface is stored in a global variable. We delete messages beyond 20 records. Add an HTML Node and paste this code. AngularJS ng-repeat class is used to browse the array returned by the previous function. We created a label in red with the topic. Next to a chip (ul), it displays the value returned by the event of the Dashboard. For you to test now! Paste the code from this flow to quickly test this example. 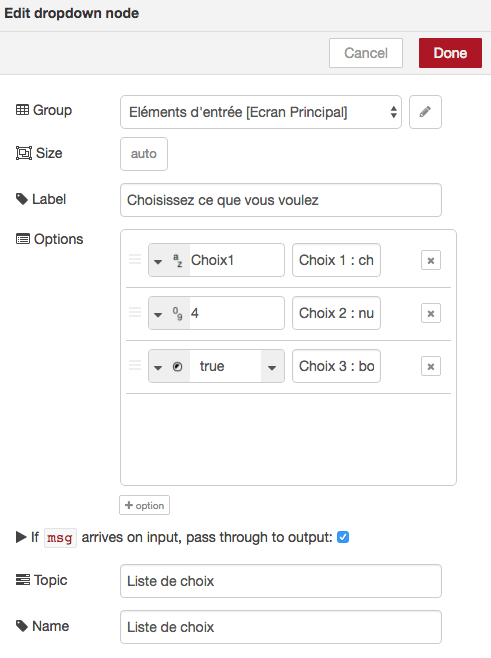 In the second part, we will see how to integrate output elements (gauges, charts, notifications…).